Special 4-5 is the fifth level of Special 4 in Super Mario 3D Land. It is loosely based off of World 3-3. The player starts out on a platform and must cross two collapsible rock platforms to go onto the next platform that contains a Dry Bones, a ? Block and several Brick Blocks. If the player hits the ? Block, a Poison Mushroom comes out. The player then has to cross some more collapsible rock platforms before reaching another platform with a Dry Bones on it. The player then needs to cross another set of collapsible rock platforms before reaching a platform with four Brick Blocks, a ? Block and a Boo. The ? Block contains a Super Star, which the player can use to destroy the Boo and then cross another set of collapsible rock platforms that have Boos and Peepas on them. The set of collapsible rock platforms also has a Red Ring on it, which spawns five Red Coins. If the player collects them all in time, they receive either a power-up or a 1-Up Mushroom. The player then reaches a platform that has the Checkpoint Flag on it, before crossing another set of collapsible rock platforms before having to Wall Jump up some platforms. The player then drops down onto some more collapsible rock platforms, after crossing a few of them the player sees a Big Boo that they have to avoid. The player soon finds a Warp Box that warps them over to a platform that has several collapsible rock platforms that lead to the Goal Pole. Star Medal 1: Above the row of blocks near the beginning and behind the set of platforms, the Star Medal is on another platform below. 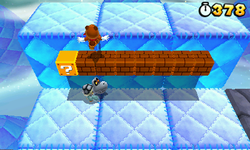 Star Medal 2: After the wall jumping segment, the Star Medal is floating above the player, they need to Wall Jump again to receive it. Star Medal 3: The Star Medal is in between two collapsible Rock Platforms.